London Bridge attack suspect as local Barking, London resident by the name of Mohammed. London Bridge attack suspect as local Barking, London resident by the name of Mohammed also known as Abs. London Bridge attack suspect identified as a Barking, East London Pakistan resident who had been known to authorities and who slipped through the cracks. 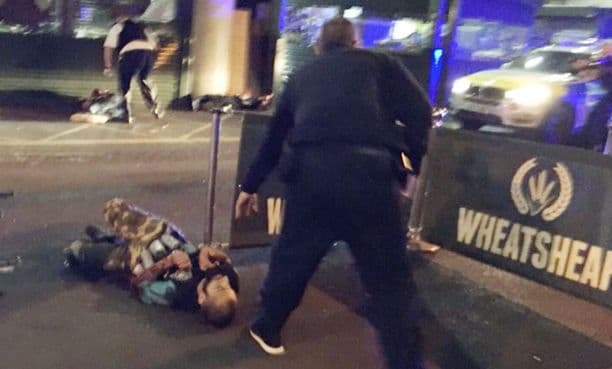 A 27 year old Barking, East London resident of Pakistan origin has been identified as one of the three Jihadi terrorists who wrought havoc Saturday night along London Bridge. The individual, a known radical Muslim militant, whose name authorities have yet to publicly release was revealed to have been known to authorities and having ’slipped through the cracks’. Disclosure of one of the three suspects came less than a day after three individuals drove a white van along London Bridge, purposefully hitting pedestrians before alighting and slashing at passerbys and patrons and nearby establishments. In total 7 individuals were killed and 48 persons injured, 21 critically along with all three suspects shot dead by police snipers. Having earlier in the day gone to flats in Barking where a total of 12 individuals (seven women and five men) were rounded up for questioning, neighbors told of the ‘likable Muslim man’ living in the community with a wife, two young children along with his elderly mother. London Bridge attack suspect wearing Arsenal football jersey. Notice of one of the suspect’s identity came after Barking flat residents recognized one of the three assailants after an image of him wearing an Arsenal football jersey was disseminated. To date, authorities have yet to say if they have been able to identify the other two men involved in the London Bridge terror attacks. One witness who recognized the suspect after recognizing the man in an Arsenal jersety told of the ‘likable’ man often participating in soccer games with neighborhood children. Told Ken Chigbo, 26, a market analyst via the guardian: ‘I saw him yesterday at about 3pm and he was wearing exactly the same clothes’. Chigbo added that he had known the man to ‘say hello to’ for three years and occasionally played football or table tennis with him at the flats. The man had invited him to a BBQ at the flats last week. Chigbo went to add having observed lots of men often coming and going from his neighbor’s flat. Other neighbors said there had been reduced activity in recent weeks. Another local resident at the Barking flats described the suspect appearing to be ‘euphoric’ just hours before Saturday night’s attack and having asking about how to hire a van previously. Seva Litvjakovs, a neighbor, said the man was called Mohammed, known locally as Abs. ‘I spoke with him yesterday, about 5pm,’ told the man to reporters on Sunday. ‘He seemed to be tidying up his car, taking stuff out. He was with two other guys. He was wearing his Arsenal shirt. I just said ‘hi’ and asked if he was OK. He said everything was fine. He had a British accent. His beard was longer, bushier [than in a photo he was shown]. While the man may have portrayed a down to earth likable aura, new reports tell of the 27 year old Barking resident harboring extremist sensibilities and ideology. 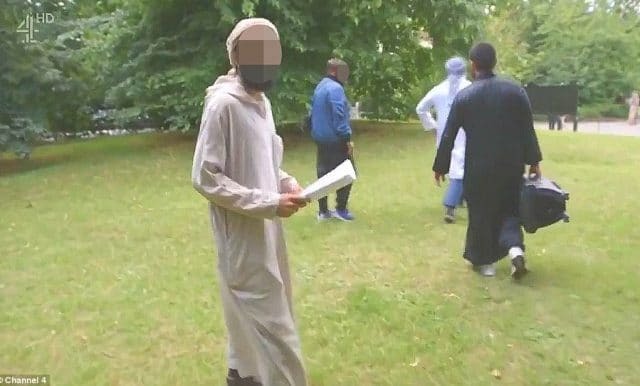 According to the dailymail, the 27 year old Barking resident had last year appeared in a TV documentary about British Jihadi’s on Channel 4 news. 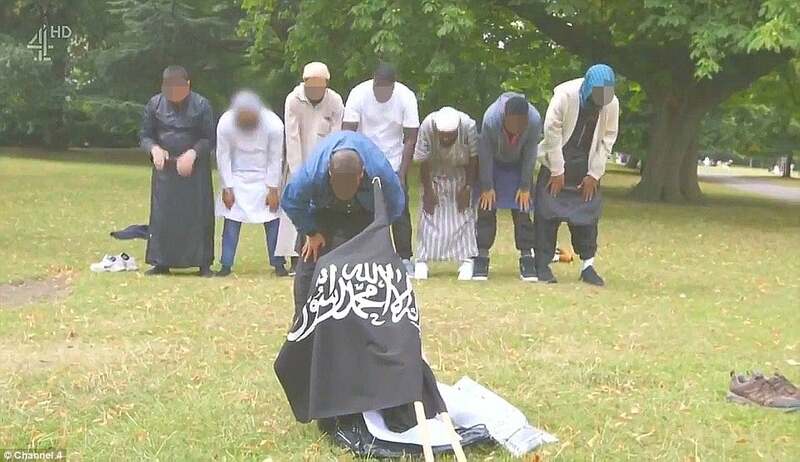 Furthermore, at the time, the Muslim man had been caught on film involved in an altercation with police after an Islamic State flag was unfurled in the park. 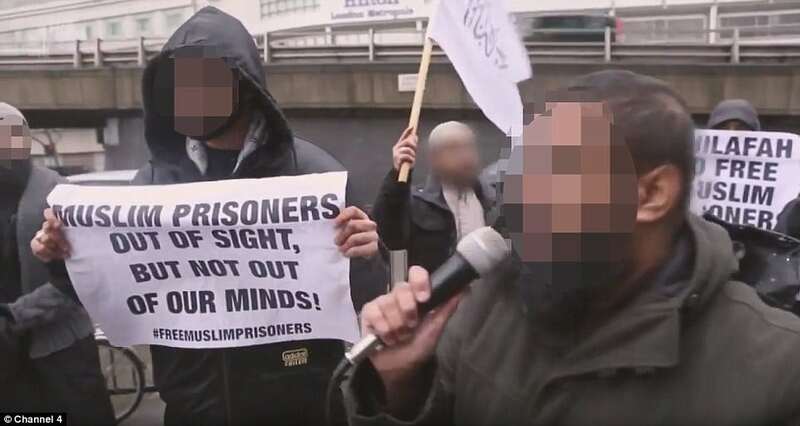 The man had also been caught on camera alongside two notorious preachers who were well known to police and intelligence officials because of their extremist views. Amid a series of revelations last night, it was claimed that a friend of the Watford-born suspect had reported him to the anti-terror hotline after he became radicalized by watching extremist videos on YouTube. Meanwhile a neighbor claimed that they warned police about the suspect radicalizing children in a local park two years ago. She said she took four photographs of him and gave them to the police. She said that she then heard nothing. Another incident reported in the guardian included neighborrs saying the suspect being ejected from a local mosque after questioning an imam during a sermon about people “using their vote wisely” in the run-up to the 2015 general election. A spokesman for the Jabir bin Zayd Islamic centre, which neighbors said was one of two mosques the suspected attacker had attended, confirmed that incident had happened but said the man involved was not a regular and was not known to them. London Bridge attack suspect (pictured left). Reacting to having letting a militant with violent designs slip through the cracks, the MI5 has claimed having to prioritize monitoring those jihadists who have known attack plans as oppose to those individuals simply flagged up as an extremist, arguing that in and of itself confer a ‘suspected’ militant of being a known risk. Intelligence officers have identified 23,000 jihadist extremists living in Britain as potential terrorist attackers. Last week senior Whitehall sources pointed to the ‘unprecedented’ scale of the threat facing the security services. At any one time MI5 has around 500 live investigations, of which several are plots to attack in the UK. In the interim ISIS have claimed responsibility for the latest attack as authorities try to piece together what degree of outside involvement and coordination took place or whether Saturday’s carnage was the result of violent ideologues inspired by the militant group.